The exhibition ends on 29 November 2018 04.00 pm. Exhibitors may begin to dismantle stand construction directly after the exhibition but NOT earlier. Please use the official Conference logo for your Newsletter or Homepage. You will receive the amount of free ticket codes included in your booked exhibition package before the conference by email. The mains voltage on the exhibition ground is 220 V of AC, 50 Hz. The exhibition package includes an electric main connection up to 3.0 kW, 1 socket for a stand 6 m². The installations may be carried out solely by the authorized contractor. The organizers cannot accept responsibility for loss or damage to the private property of participants and accompanying persons which may occur either during or arising from the congress. Participants should therefore take whatever necessary steps regarding insurance. 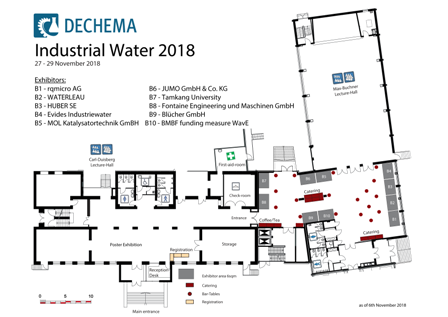 All exhibitors and visitors can use the free WiFi available at the DECHEMA Haus during the opening hours of the conference. You will be asked for a password wich you will find on the last page in the printed programm which you will receive on site. There are limited parking lots available at the DECHEMA Haus. Please notify the Conference Organiser in advance, if you want to reserve one of those (free of charge). A multi-storey car park is also available in 5min walking distance. DECHEMA is in charge of general security. The exhibitor is liable for all exhibition goods on his stand. The exhibition area is closed during the night. If required a quotation of stand surveillance can be solicited by DECHEMA. DECHEMA does not accept any liability for damage or loss to any items. It is possible to use your own display wall system with a maximum height of 2.50 m. Booth construction materials and decorations must be flame-resistant – at least B1 in accordance with standard DIN 4102! Please return the equipment and the stand area in good condition. Foyer floors and foyer walls may not be damaged. Interventions in the structure and equipment of buildings components and technical facilities shall not be damaged, dirtied or otherwise altered, e. g. by drilling into same or driving nails or screws into same. Painting, wallpapering, or affixing items are also prohibited. The storage of stand materials or empties in the exhibition area during the exhibition is not possible. We will provide a store room for the duration of the exhibition only for an appropriate quantity of stand materials or empties.